Can’t Remove Registry Scanner? This page includes detailed Registry Scanner Removal instructions! Registry Scanner is promoted as a great optimization tool. It is supposed to speed up your system by removing old registry entries and junk files. Once you install it though, the app reveals its true face. Security researchers report that Registry Scanner uses misleading and deceptive scan results to turn its users into paying customers. They categorize the app as a PUP (Potentially Unwanted Program). It is not a virus, but a deceptive app that can lure you into unwanted actions. Don’t get confused! There is nothing potential in your situation. Registry Scanner is a trickster which has no place on your computer. It employs false positives and deceptive marketing strategies to lure you into purchasing its license key. Once you install the app, it performs a system scan. It detects dozens and dozens of issues and prompts you to purchase its full version which is supposed to fix the detected problems. The PUP floods your system with countless warnings and alerts. It urges you to take action. And if you refuse to open your wallet, it makes your user experience miserable. This parasite uses every opportunity to interrupt you with an alert of some kind. It opens pop-ups and notifications. It displays dozens and dozens of scan reports. And guess what! The scan results are often exaggerated or fake. Registry Scanner is not trustworthy. Do not waste time with this PUP. Do what’s best for you and your system. Remove the deceptive Registry Scanner for good! How did I get infected with Registry Scanner? Registry Scanner has an official website and download. This, however, is not its main distribution channel. The PUP uses trickery to sneak into your system unnoticed. It employs software bundles, torrents, and fake updates. The PUP lurks in the shadows and waits for you to make a mistake. The parasite needs you to let your guard down. Do not give into naivety. Don’t make its job easier. No anti-virus app can protect you if you throw caution to the wind. Only your vigilance can keep your system secure and virus-free. Even a little extra attention can spare you an avalanche of problems. Don’t visit shady websites. Download software and updates from reliable sources only. And, of course, take the time to install your apps properly. Opt for the advanced/custom setup option. Under it, you would be able to examine and deselect all bonus apps that might have arrived alongside the program you’ve downloaded. Make sure you know what you install. Read the terms and conditions before you agree to them. If you cannot spare enough time to go through the whole document, scan it with an online EULA analyzer. Opt out of the installation if you notice anything suspicious! Why is Registry Scanner dangerous? Registry Scanner is not a direct danger to you and your system. The app is considered a parasite due to its deceptive nature. It uses deceitful sales tactics to lure you into unwanted actions. The PUP is a manipulator. It floods you with alarming scan reports that push you into impulsive actions. Do not swing into action, though! The scan results are not trustworthy. Registry Scanner itself is not trustworthy. This app with questionable functions is a complete and utter menace. It slithers into your system and makes a mess of it. The PUP has only one goal: to turn you into a customer. To do so, it bombards you with misleading notifications and pop-ups. You can barely get any work done. The parasite always finds a way to make your tasks harder. It interferes with your every activity. Its pushy actions, of course, are likely to cause performance issues. The numerous notifications burden your system. You may experience (especially if your machine is older) system underperformance and freezes. Do not put up with this! Find where Registry Scanner lurks and delete it upon detection. Remove this PUP the first chance you get! How Can I Remove Registry Scanner? If you perform exactly the steps below you should be able to remove the Registry Scanner infection. Please, follow the procedures in the exact order. Please, consider to print this guide or have another computer at your disposal. You will NOT need any USB sticks or CDs. 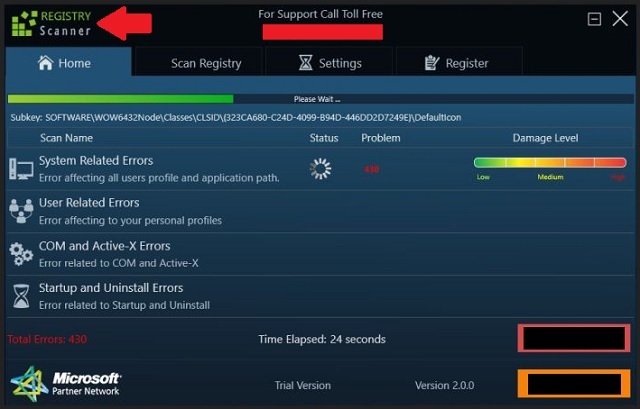 Locate the Registry Scanner program and click on uninstall/change. To facilitate the search you can sort the programs by date. Review the most recent installed programs first. In general you should remove all unknown programs. Navigate to C:/Program Files and delete Registry Scanner folder. Double check with any antimalware program for any leftovers. Keep your software up-to date! Registry Scanner may have the ability to replicate itself, if not completely cleaned. This may require tracking down hundreds of files and registry keys. You can choose to use Spyhunter Professional Anti-Malware Program to deal with any infection that might be lurking along with Registry Scanner!